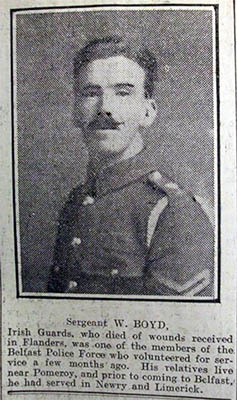 Brother and Sergeant William Boyd, Irish Guards. ex R.I.C. 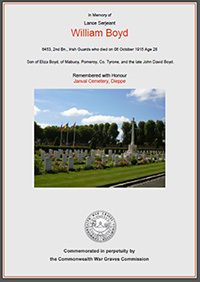 Brother & Sergeant William Boyd, Irish Guards. ex R.I.C. 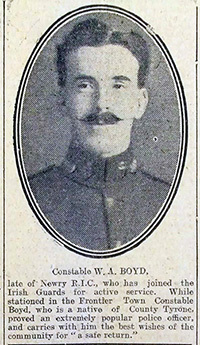 William Boyd was the son of Eliza Boyd, of Mabuoy, Pomeroy, County Tyrone, and the late John David Boyd. 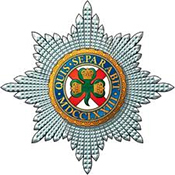 William served in Limerick and Newry as a Police Constable with the Royal Irish Constabulary prior to being based at Craven Street Barracks, Belfast, before enlisting with the Irish Guards. His RIC Service number was 61803 and his Guards Service number was 6453. 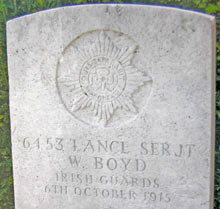 Lance Sergeant Boyd was severely wounded by shell fire in the attack that followed during the Battle of Loos in Flanders, he was taken to hospital in Dieppe and died of his wounds there. He is buried in grave 1-A-6 at Janval Cemetery, Dieppe, France. William Boyd Police Constable RIC Newry was balloted for on 1st June 1909. However having failed to present himself for initiation in accordance with the Lodge by-law No 8 it was proposed and unanimously passed by the Lodge at a meeting on 27th September 1909 that William Boyd be initiated without a new ballot. He was subsequently initiated by Worshipful Brother Henning. The Fellow Craft Degree was conferred by Worshipful Brother George Auterson on 26th October 1909. Master Mason Degree was again conferred by Worshipful Brother George Auterson. On 11th July 1911 Brother William Boyd received his Grand Lodge Certificate. The burial place of Brother William Boyd. © Copyright 2015 St Patrick's Masonic Lodge No. 79 Newry.